EVERSHOLT is a parish, in the hundred of Manshead, union of Woburn, county court district of Ampthill, rural deanery of Fleete, archdeaconry of Bedford, and diocese of Ely, situated about two miles from Woburn, on the borders of the park; the parish consists of several clusters of houses, called ‘Ends.’ The church of St. John the Baptist is a neat structure, in the Gothic and Early English styles, with nave, chancel, aisles, and square tower, containing 6 bells; it underwent a complete restoration in 1864, under G. G. Scott, Esq., at a cost of about £3,000: there are monuments to the Hon. Frances Henley Ongley, eldest daughter of the Right Hon. Samuel Henley, first Baron Ongley; Mrs. Elizabeth Hyde, sister of the Bishop of St. Davids; and Mrs. Sarah Hodgkinson. 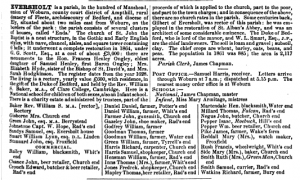 The register dates from the year 1628. The living is a rectory, yearly value £600, with residence, in the gift of the Duke of Bedford, and held by the Rev. William. S. Baker, M.A., of Clare College, Cambridge. Here is a National school for children of both sexes, and an Infant school. 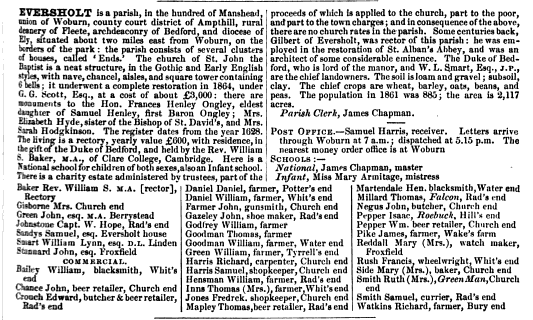 There is a charity estate administered by trustees, part of the proceeds of which is applied to the church, part to the poor, and part to the town charges; and in consequence of the above, there are no church rates in the parish. Some centuries back, Gilbert of Eversholt, was rector of this parish; he was employed in the restoration of St. Alban’s Abbey, and was an architect of some considerable eminence. The Duke of Bedford, who is lord of the manor, and W.L. Smart, Esq., J.P., are the chief landowners. The population in 1861 was 885; the area is 2,117 acres.